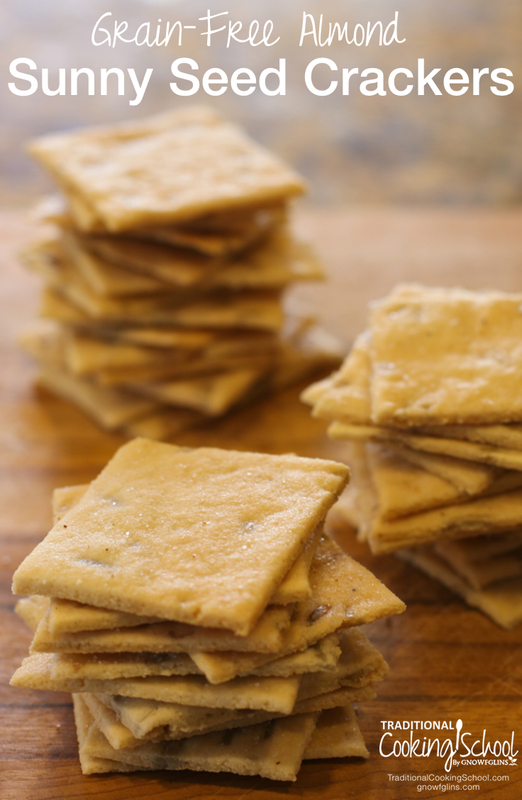 These GAPS-friendly crackers satisfy a huge need in our family! They pair well with so many foods — yogurt cheese or cheese, salmon salad, egg salad, almond butter, and more. While these crackers hold together pretty well, they are slightly more fragile than grain-based crackers, especially if omitting the sunflower seeds. Enjoy! Preheat oven to 325 degrees Fahrenheit. In mixing bowl or food processor, combine all ingredients. If using food processor, reserve half the sunny seeds to pulse in briefly at the end. Separate dough in half. With a rolling pin, roll each section of dough between two pieces of parchment paper until 1/8 inch or more thick. This dough will easily keep getting thinner and thinner, in the end leaving you with fragile crackers — so don't go too thin. Also compare what you're rolling out to the size and shape of your cookie sheet. Gently peel back top piece of parchment paper. Sprinkle salt all over the top of the dough. Use rolling pin once over all the top to press in the salt. Use pizza cutter to cut into 1-inch to 2-inch crackers. 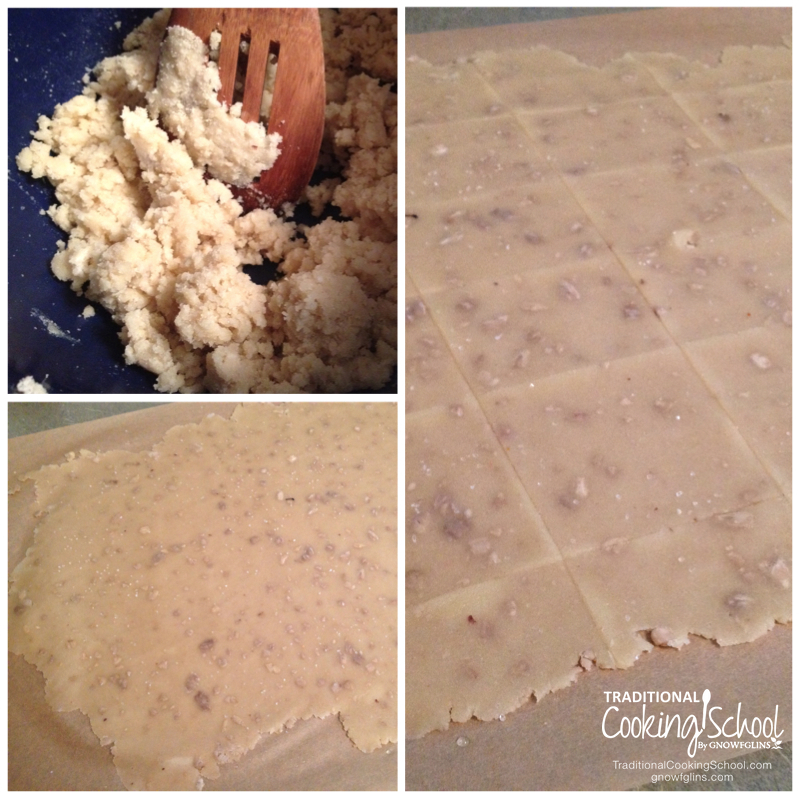 Gently transfer parchment paper with crackers to a cookie sheet. Bake for 12 to 15 minutes, checking frequently after 10 minutes of baking to remove browned crackers as needed. (Almond flour browns quickly — these go from perfect too burned in seconds!) Repeat with other half of dough. When cool, store in an airtight container. Enjoy! Want more GAPS info? GAPS is a gut-healing diet, and we're writing a whole series on it. What are your favorite grain-free crackers? Thanks for these, we’re totally grain-free these days and we miss crackers! These are just what I was looking for, an easy reacipe to use up all the almond flour I’m getting from making my son’s almond milk. Thanks! They are indeed good. I made a recipe from one of the nourishing blogs that had raisins, almond flour, and rosemary. I can’t tell you how good they were with honeyed goat cheese. And my pate. And caviar. Our kids simply swooned. Not soaked? Do you make the flour out of crispy nuts? Is almond flour just finely ground almonds? Can I make my own with my vitamix? yes you can I buy whole almonds and grind them in my vitamix works great. I also do all the other seeds I need to “flour”. Just grind until desired consistency is reached.! Can’t wait to try these! Thank you Wardee! Raw version: soak raw almonds overnight, blend them in the Vitamix (or regular blender) the next morning, squeeze out extra liquid in net bag or cheesecloth. Use this almond meal as the almond flour. 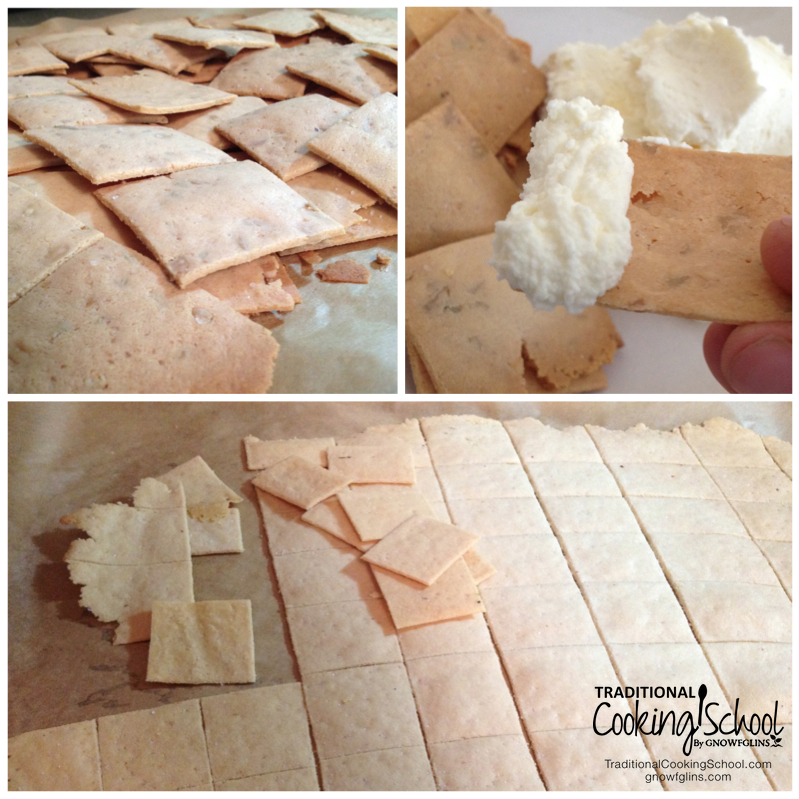 “Cook” crackers in a dehydrator (or outside in the sun under cheesecloth!) instead of the oven. YUM! Amy – Sorry! I meant to clarify that in the post. Either make your own almond flour from soaked/dehydrated almonds (with or without skin), from blanched almonds with skin popped off then dried, or use ready to go blanched almond flour. Mainly the anti-nutrients are in the skin. I love blanched almond flour because it is ready to go! I *think* you can use almond pulp (really squeezed out) but omit water in recipe. Wardee, these look nice! I’m having a hard time understanding this sentence, though: “Bake for 12 to 15 minutes, checking frequently after 10 minutes of baking to browned remove crackers at the edges.” Is there a period missing after “browned”? Then remove the crackers at the edges and let the rest keep baking? Looking forward to giving them a go, J. Sorry! I fixed it. Two words got switched around. You remove browned crackers as needed. They will be at the edges. Looks good! I wonder if they taste great with salsa? So excited to find you! Tawny — Sure 🙂 If solid, make sure to lightly melt it so it acts like liquid. Wardee – do you think these would be even better in the dehydrator? And if so, would they be any healthier for us? I am assuming there is no real difference in nutrition based on the ingredients. Is that right? Just made these and I must say they are pretty tasty! They were SUPER easy and mixed up VERY quickly. I used a Tbl. Seseme oil and a Tbl. Ghee. (only because I am waiting for my evoo in the mail 😉 ) Great cracker recipe for those of us who are gluten or grain free. Thanks again! Maureen — If you’re using blanched almond flour, the almonds are already heated, so dehydrating is sort of pointless (because usually we dehydrate to keep foods raw). If you make your own almond flour from soaked almonds, then yes, it would be healthier because they’d still be raw out of the dehydrator. I’m not sure of the results though — perhaps less crisp? That was what I was thinking but I wanted to be sure. They sure are good! My husband said they taste better to him than store bought crackers! Thanks for the recipe! Oh thank you! This soon to be mama again needs some crackers! And my nausea didn’t start rolling at these. We are making them right now! I just made these crackers. They are delicious! So easy! I rolled, scored, and baked the crackers on a Silpat the size of a half sheet pan which made things even easier … and the crackers don’t burn … in fact I had to bake them a few minutes longer. (I know not all of you might be comfortable using a silicone Silpat though.) Since I baked on a half-sheet pan, I was able to bake the entire batch of dough at once saving time. I tried a batch with hazelnut flour too and they are equally delicious. I think if I leave the salt out of the next hazelnut batch that they will have the taste of a favorite biscotti. Is there a recommended seed that could be used instead of the almond flour for those with nut allergies? Pumpkin seeds or sunflower or a mix of the two…what about coconut flour mixed in too? Just wondered what your thoughts were regarding if this change to the recipe might work…Thanks for the inspiration!